Fire dancers at Seth and Elena’s vegan potluck. Three pairs of eyes were staring at me. This was the routine. Gus had been doing it the longest, all the way back to when he and the pretty woman lived alone. Then she brought home this big guy and the other two. Kofi and Elliott caught on pretty quickly. They learned the ropes from Gus and the pretty woman was just so nice, who wouldn’t do anything for her. The three of them sat patiently, Elliott on my right, Kofi on my left, and in the middle, as always, Gus. I most certainly wasn’t one of the right ones, but I knew the routine and would do until the big guy and the pretty woman returned. So far, they always returned. Drool started bubbling up out of Elliott’s mouth. Had they waited long enough? 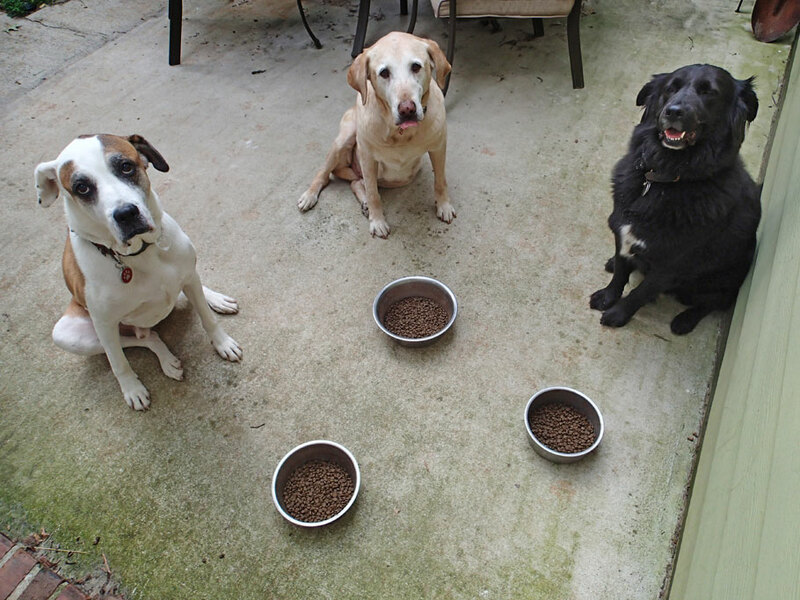 I said the magic words, “one, two, three, go!” The boys dove into the food bowls that had been sitting at their feet this entire time, a meal well earned. Gus, Elliott and Kofi were just three of the 37 pets we took care of this summer. All totaled there were 17 dogs and 13 cats who we lived with in 15 different homes and 2 more dogs and 5 cats we made visits to in three additional households, everyone with their own routines and peculiarities, some more interesting, complicated, or peculiar than others. We arrived in Cabbagetown on May 7th at our friend Debbie’s house with no house sitting scheduled until May 22nd. But as always, our life in Cabbagetown took on a life of its own. We only spent one night at Debbie’s before the calendar started filling up. Out of 5 months we spent maybe only three weeks with friends when we found ourselves homeless. We usually moved once a week, but some times twice and Greg and I only spent a few days sleeping apart when house sitting gigs overlapped. Our shortest move was from one house to the one right next door to it. We moved 23 times, moving into a handful of houses more than once or twice. Making money was an imperative this summer. Even though we have essentially become minimalists and have sold most of our possessions, somehow we now spend more money on stuff. Blue Wing has lots of needs and most are pretty pricey. Greg is usually the winner of most of the green in the summer, but this year I had several opportunities to also contribute to our â€œcruising kitty.â€ A good friend got me a job waiting tables at lunch where she works twice a week. I haven’t waited tables in a long time and was pleased to find out I still had the skills and that people for the most part are very generous tippers. In addition to this steady work, I also was hired for a few web development jobs in the neighborhood. It seems quitting my professional career five years ago, was just what it needed to take off. Greg teamed up with another Cabbagetown â€œhandyman,â€ Paul. They did a few jobs together last year, but this year their painting skills were in high demand. They painted three entire house exteriors, lots of porches, decks, fences, wicker furniture, and interior rooms. Greg also had a handful of â€œodd jobsâ€ and we did an odder than usual one together. 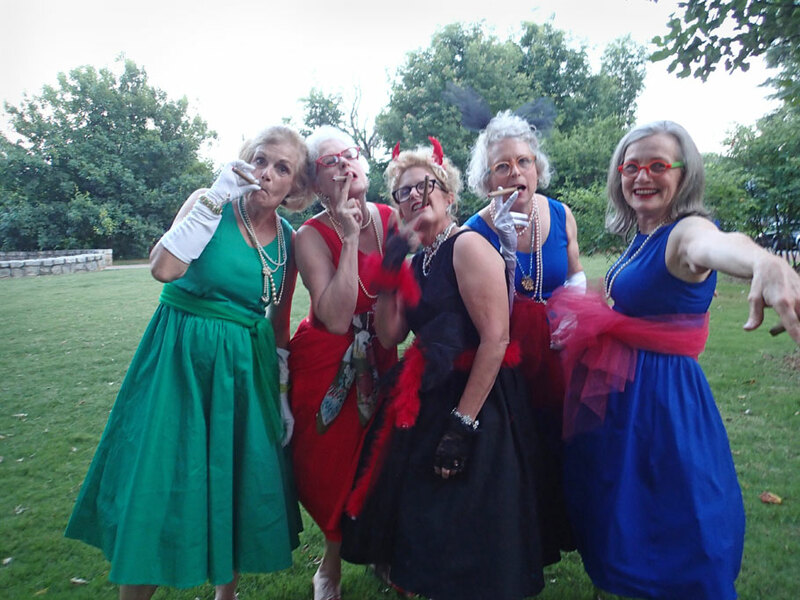 Hired as the cleanup crew for a celebration of two of the Cabbagetown Diva’s 60th year, these amazing women got as wild as they wanted with no worries about the end of the evening. Berth made Me, Greg and Paul a special lunch as a thank you for heading up the all volunteer project to paint her house. 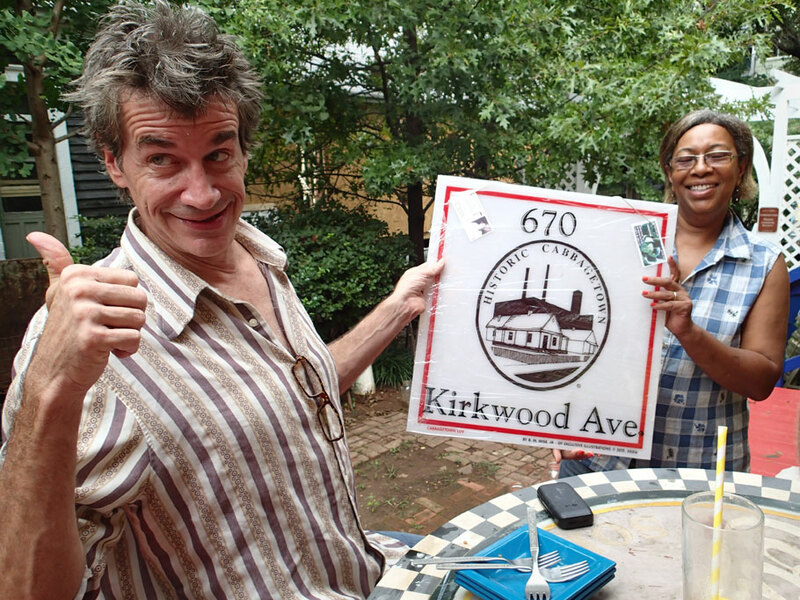 Paul also received one of Bertha’s specially designed Cabbagetown house signs. One of the best things about returning to Cabbagetown every year is seeing our old friends, but we also met lots of new people this year. Through the Let’s Paint a House project we made the acquaintance of many generous people who donated their time and money. We met Nick and Cyndi and their three sweet dogs Kofi, Elliott, and Gus. 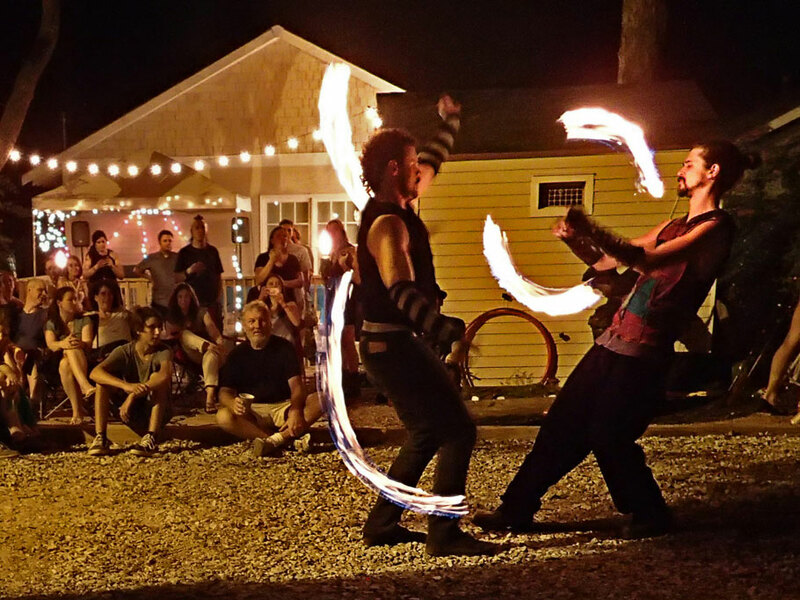 Then there was Seth and Elena, who threw an amazing vegan pot luck with fire dancers. We also had many new house sitting clients this year, like, Kim and Les, with their dogs Zoe, a rescue Greyhound, and the really, really big hunk of love, Claire; and Lily and Brie with their oh-so patient cat Carl. It seems each year that we come back, we make more friends and feel more connected to the neighborhood as we live, work, and socialize all in one place, our world becomes so much smaller and but at the same time bigger with each new relationship we make. Wow, now that I have wrapped up the summer maybe we get on to the trip!!! We are currently in the work yard getting Blue Wing ready to go into the water. We have been working hard this past month and a half improving and upgrading just about everything about Blue Wing. There will be more post about those things to follow, then we will splash and be on our way south to Mexico, Belize and Honduras! 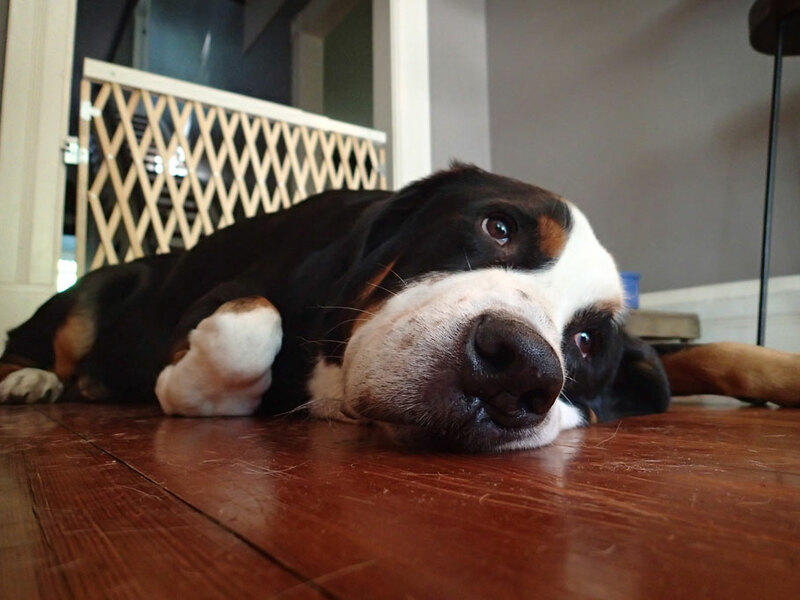 To see a gallery of all of the pets we house sat for this summer, click here. Elliott, Gus, and Kofi wait patiently for the magic words. Some of the best people in the world and Debbie’s mom three times. Click to enlarge this photo. Although we didn’t make it to New Orleans, we were able to do some visiting this summer with family. 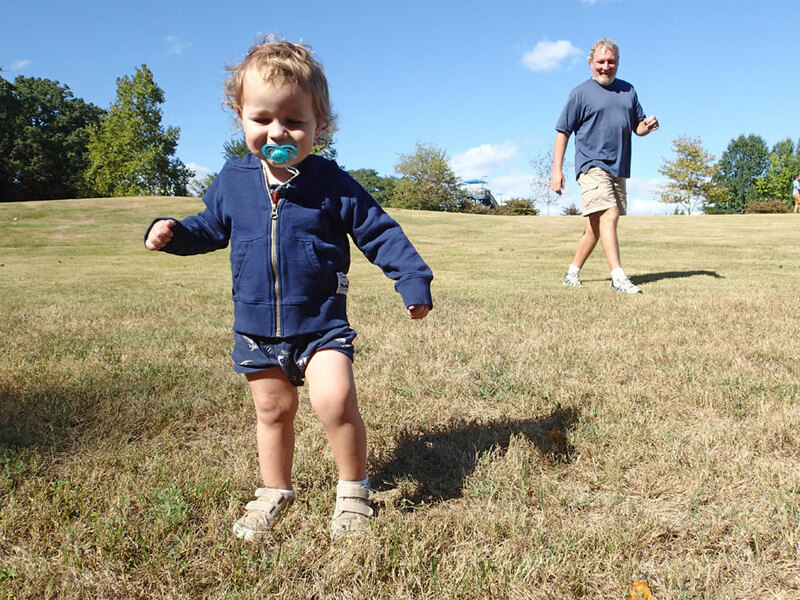 Here is Greg with grandson Gabriel. You are here. Our friend Martha gave us the pink flamingo whirligig to place in front of where ever we were staying so our friends would know where to find us and in case we got confused we’d know where to go home to at night. 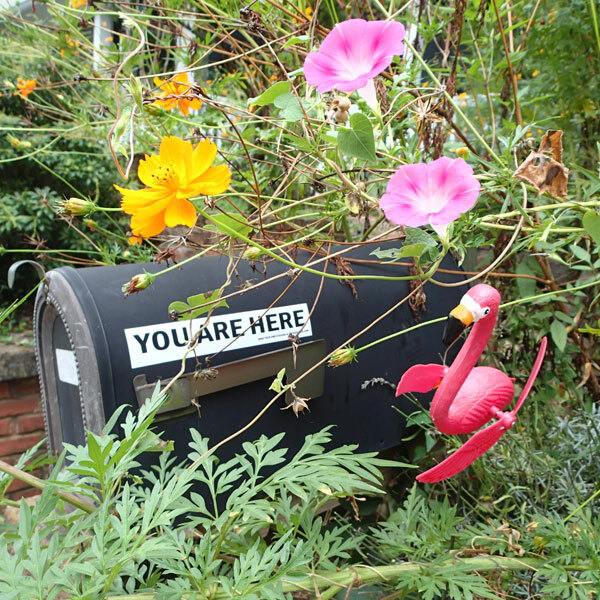 This entry was posted in Cabbagetown, House Sitting Cabbagetown, Odd Jobs Cabbagetown and tagged Cabbagetown. Bookmark the permalink.